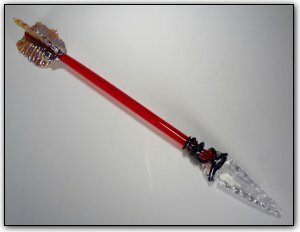 This hand sculpted glass arrow features a sculpted dichroic arrowhead wrapped on an iridescent cherry red shaft, with golden feathers on the back. Make sure to zoom in to see such intricate details in each section of the arrow, so amazing! This arrow is flung straight from Cupids bow down onto earth. Shoot your lover in the heart with this one of a kind sculpture and watch the sparks fly.